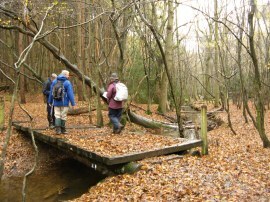 Having completed the Greensand Way the previous month the walking group has now started on the High Weald Landscape Trail, a path which runs for about 90 miles between Horsham and Rye. 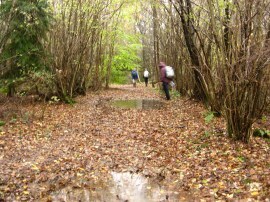 We walked this, the first stage between Horsham and Cuckfield, on a very damp November day. Having met up at Cuckfield, where there is a free car park on Broad Street which is only just off the route of the path, we took a couple of cars over to Horsham where we parked in the car park of Horsham Station which is also free to park in on Sundays. The walk is indicated as starting at the station and from the car park we wandered round to the front of the station to see if we could see any sign or notice describing the trail. 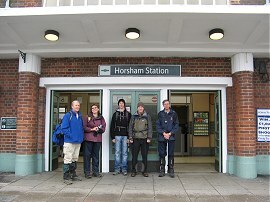 Having failed to spot anything we took a group photo outside the station entrance, photo 1, and then following the first walk way markers for the route we retraced our steps back under the railway lines and into the car park. Leaving the car park the route heads briefly down Station Road before heading to the right down Depot Road, photo 2. 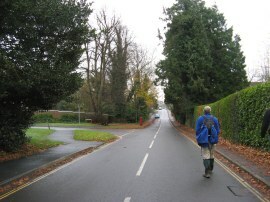 This long straight road is followed down to Comptons Lane which the route crosses to head into Hampers Lane. 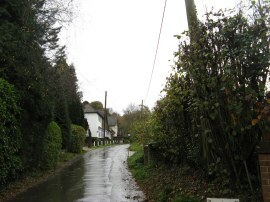 The road narrows as it leaves the houses and passes through a small wooded area with a stream running through it, photo 3, before continuing ahead as the tree lined lane runs between fields. Where the lane bends to the left the High Weald Landscape trail joins a footpath that runs alongside the edge of a field before heading across an area of more scrubby ground to join a broad track. This is followed for a short distance as it bends round to the right past what looked like a moto-cross track before heading into an area of woodland, photo 4, that makes up part of St Leonards Forest. This section of the path was well signposted with green or silver trail markers at all major path junctions, photo 5.The path makes its way through the trees, sometimes on broad forest paths, at other times or narrower tracks, photo 6. 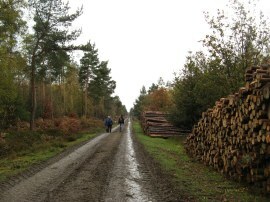 Reaching a broad forestry track, photo 7, known as Mick Mills Race the route heads to the right. The path was lined with stacks of timber and in places the path was quite muddy from the recent forestry works. As we were walking along this stretch of path it started to rain, not to heavily but fairly insistently however it was quite mild and thus I decided to keep my fleece on rather than get out my waterproof coat. Reaching a junction of paths the route heads to the left then almost immediately bears to the right along a narrower path that heads downhill through the trees to cross Frenchbridge Gill, photo 8. 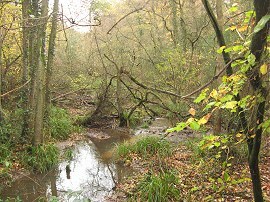 The Wealden Forest Ridge is the watershed between the River Thames and the South Coast and the small streams flowing south are called gills and eventually meet to form the River Arun. The path then heads back uphill to cross Grouse Road before continuing ahead through another small section of trees to reach an open field. It was Remembrance Sunday and as it was now 11 o'clock we all stopped to observe two minutes silence although I think we mistimed it slightly as during our silence we heard the boom of a distant gun and followed shortly after we had re-started by two more booms. Resuming our walk we headed to the left along a very muddy and slippery track running over the middle of the open field. Reaching the end of the field the route heads to the right to cross over Newstead Gill, photo 9. Once over the gill the route heads uphill along what soon becomes a surfaced track where we were passed by a number of vehicles including a bright green van with the doors hanging off the back and dents over the rest of the bodywork. Away to our right we could see another patch of St Leonards Forest across the field, photo 10, and while it had a certain charm it would have looked considerably more attractive on a bright and sunny day. The route heads slightly downhill to cross over an embankment that runs high above Hyde Gill before continuing on to reach Carterslodge Pond, photo 11. 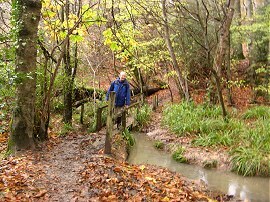 The path then follows Carterslodge Lane up to the B2110 Handcross Road. Here we headed to our left along the roadside. Reaching the entrance to Ashfold Farm the route joins a footpath that runs alongside the driveway before crossing a small paddock to join a path that runs along the edge of a patch of woodland for a short distance before bearing uphill to the left to reach Coos Lane. 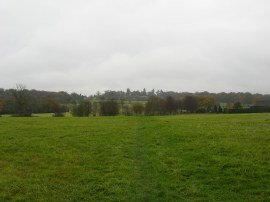 The High Weald Landscape Trail heads to the right along the road for a few yards before joining a track on the left although there was a walk way marker that as rather confusingly pointing to the right back into the field we had just left. The path then ran between fields, crossing another small gill in a band of trees before joining a road on the edge of Slaugham, photo 12. 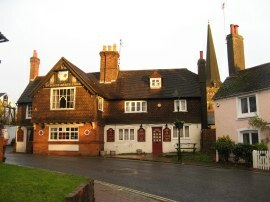 Here the route briefly links up with the route of the Sussex Ouse Valley Walk , heading to the right through a white gate and along Park Road towards St Mary's Church, photo 13. There were a number of very attractive houses in the village along with a phone box that had been rather strangely painted an off white colour by the villagers. The phone box had a sign attached to it informing BT "Please do not attempt to repaint it", although to me it looked rather ugly. 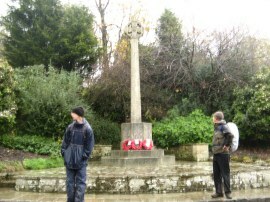 We had reached about the half way point of our walk and as it was still raining we took shelter in the porch of the church to eat our lunch where we were soon joined by a member of the British Legion waiting to lay a wreath in the church. Apparently the vicar covers two churches and the remembrance day service alternates between the two and thus he was waiting for the vicar to return from the other church. We were a little unsure about eating in the church porch but the vicar made us very welcome when he did turn up. 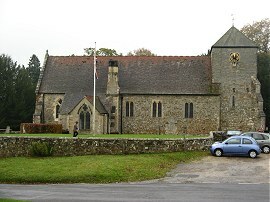 I also subsequently found out that this was the church where my mother was christened, it would have been interesting to have asked if they still had any of the old parish records there to look at. While we were eating the rain had eased off a bit which gave me false hope that the weather was about to brighten up as we followed the path through the churchyard and alongside a small field to reach Furnace Pond, photo 14, the name a reminder of the time in the sixteenth century when St Leonards Forest was an important area in the iron industry. 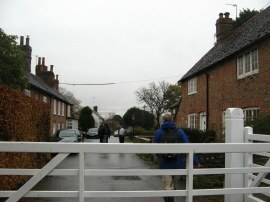 The route crosses the end of the pond before turning right, then left, by the buildings of Slaugham Place Farm. 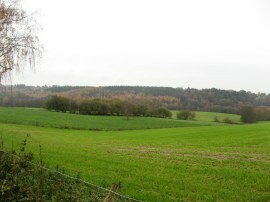 The route then heads along a farm track before joining a footpath that bears to the right over a field. The route heads over a narrow stretch of ground separating two ponds before heading gently uphill over a large grassy field which had been sub divided into a number of smaller paddocks by low electric fences, some of which was being grazed by sheep, photo 15. Leaving the field the route headed through another small path of woodland before crossing over one further field to reach the B2115 Cuckfield Lane. Here we headed to the left along the road. The road was quite busy but there was a small grass verge to walk on for most of the way up to the driveway of Portways Farm where the route leaves the road. Heading up the driveway the route passed a small stable and exercise area for the horses where we passed a rather unpleasant horse rider who said "I hate walkers" from the other side of the hedge as we went by. Leaving the drive the route turns right and then right again to head down alongside a field and over a paddock to reach Colwood Lane. Here we headed to our left along the lane, photo 16, heading uphill along the rain soaked street. The road levels off as it heads past the tall Warninglid Water Tower along to the junction with Jeremys Lane, photo 18, where the route heads left, opposite a far more aesthetically pleasing red phone box. A short distance down Jeremys Lane the route joins a path on the right that heads through the grounds of Wykehurst Park. At one point the route joins a sunken track that heads under an old stone arch that must have once carried a track over the footpath. Leaving a small area of woodland the route heads along a tree lined path that leads to the outskirts of Bolney. Reaching houses the route continues ahead along Bolney Street, passing the war memorial, photo 19, before heading to the left down Ryecroft Road. At the end of the road the route continues ahead over the old London Road to join a track that leads down to an underpass under the A23 dual carriageway. 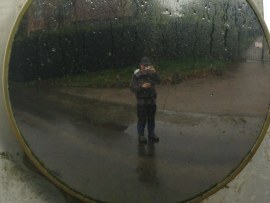 It had been raining quite heavily for the last ten or so minutes and the rain had finally exceeded the showerproof capacity of my fleece so with my shoulders getting wet I stopped in the shelter of the underpass to dig out my spare fleece and waterproof jacket from my rucksack. Once under the road the route turns to the left along a narrow footpath before heading to the right into another patch of woodland at Bolney Wood. Leaving the trees the High Weald Landscape Trail heads to the right along Buncton Lane before turning to the left up a path that runs round the edge of Pickwell House. Heading along the edge of a field the route joins a surfaced track that is followed through another small patch of trees before continuing ahead past an isolated house to reach Pickwell Lane where the route heads to the left. 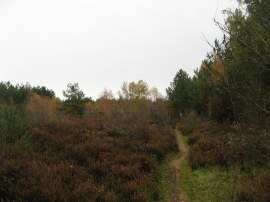 The route follows the road through woodland before joining a fairly broad track on the right, photo 20. 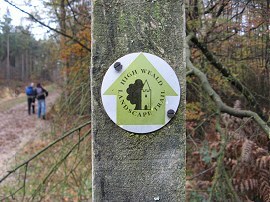 The High Weald Landscape Trail then takes a number of paths that wind their way through the trees to reach Broxmead Lane. As ever the route of the path was well signed with way markers at all path junctions making navigation easy. Reaching the road the route heads to the right before continuing ahead where the road bends to the left. 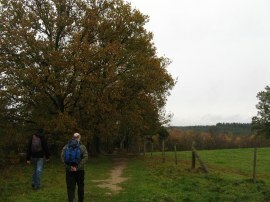 The path heads through a band of trees before bearing to the left over a field, the path heading slightly uphill. Reaching the corner of this field we headed to the right along a field edge path that leads to Deaks Lane. 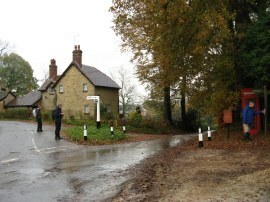 Deaks Lane is followed to the left before the route joins a footpath on the right. As with much of the route today the path then heads down alongside the edge of a field before entering into another small patch of woodland, this time the suitably named Walks Wood. 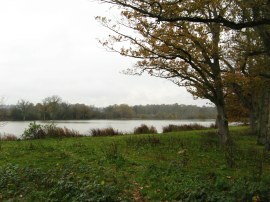 The route is now in the grounds of Cuckfield Park and the path then runs alongside a more open area before passing through one last area of trees, heading gently downhill to cross over another gill, photo 21. 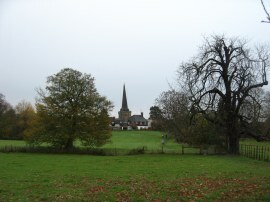 The path then heads uphill through the parkland with the spire of the Holy Trinity Church in Cuckfield prominent on the horizon, photo 22, to eventually reach South Street. The rain had finally stopped and as we headed up to the road a few rays of sunshine appeared from under the clouds, briefly lighting up town, photo 23. The route soon leaves South Street, heading up to the left along Ockenden Lane where we finished our walk along the Trail having walked 15.2 miles along the path. From Ockenden Lane it was then just a short walk back to the car park in Broad Street. 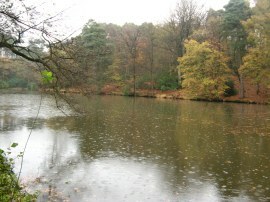 Despite the damp weather and muddy conditions under foot I had quite enjoyed this walk. It was over an area I hadn't been to before and all the areas of forest and gills running through them where very pleasant to walk through. 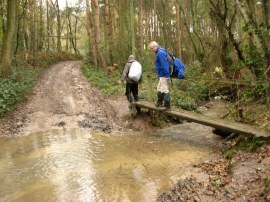 I have uploaded the route of the walk which can be accessed here HWLT stage 1 Route.